Indianapolis – Governor Mike Pence declared August 23 through August 29, 2015 as Indiana Rail Safety Week.Indiana Operation Lifesaver, Indiana State Police, Indiana Department of Transportation (INDOT), local law enforcement and railroad companies have partnered together to raise public awareness about the dangers of disregarding railroad crossings laws and trespassing on railroad property. “Train versus car collisions are completely preventable,” states Jessica Feder, Executive Director of Indiana Operation Lifesaver. Indiana Operation Lifesaver has scheduled numerous enforcement blitzes throughout Indiana involving law enforcement agencies. There will also be public safety announcements throughout the state, safety information distributed at college campuses, posters on SouthShore commuter trains and at stations, and media coverage of events. 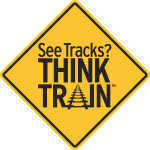 INDOT will also have rail safety messages on the dynamic message boards along major roads. Indiana Operation Lifesaver is taking a proactive lead in the elimination of trespassing and pedestrian fatalities at railroad crossings. Indiana Operation Lifesaver is a non-profit organization dedicated to eliminating collisions, deaths and injuries at highway-rail grade intersections and on railroad rights-of-way through public education, engineering and enforcement. To learn more about Indiana Operation Lifesaver, please visit them online atwww.oli.org or call (812) 528-4327.